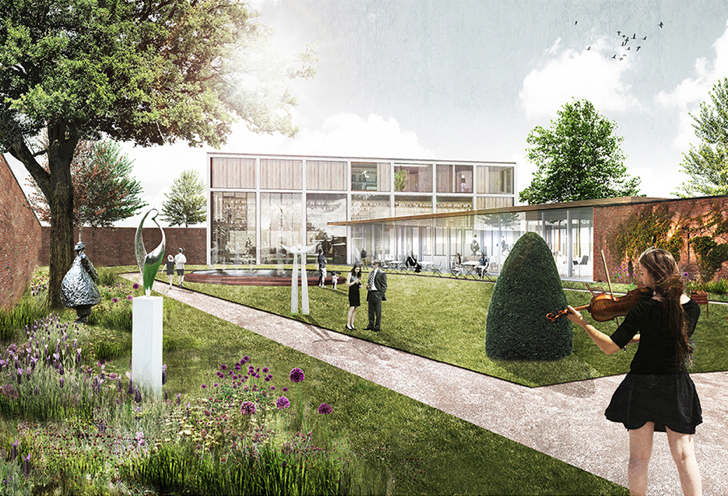 The Open Oproep 28 design competition presented the challenge of creating a space dubbed a “leisure center” for the people of Edegem, Belgium. Part community center, part art center, and part library, the space will creatively intertwine with existing landmarks. Winner Marc Koehler Architects propose “The Missing Link” to incorporate each of these elements into the municipality, which is home to a lovely 19th century garden and Renaissance architecture. The leisure center, whose construction is set to begin in 2016, will break ground in the heart of Edegem. Yet, instead of being an imposing, modern structure, the center will compliment its surroundings. Collaboration with Delobelle Architecten and DELVA Landscape Architecture will assist in this task. The lower floor will house a glass pavilion, a prime spot for visitors to practice reverent observation of the nearby garden, as well as the community center area. The library will be located in the upper level of the structure and is pictured to become a bright and calming environment for study or leisure. There is no doubt that the public will enjoy the center for what it will have to offer once it is built, yet the designers also have included local denizens in planning for the final elements of the structure. Being receptive to the needs of the community and utilizing funds from selling existing properties in the area will allow for designers to focus on making The Missing Link a more sustainable project. The new leisure center will be a stunning addition to the city’s historic landmarks, as well. The leisure center, whose construction is set to begin in 2016, will break ground in the heart of Edegem. Yet, instead of being an imposing, modern structure, the center will compliment its surroundings. 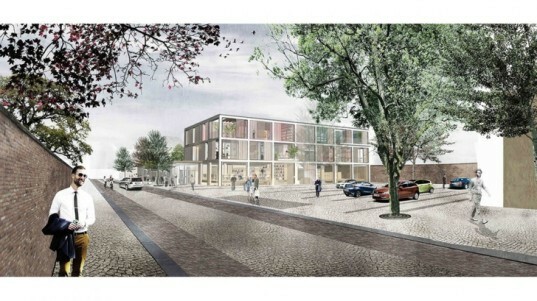 Collaboration with Delobelle Architecten and DELVA Landscape Architecture will assist in this task. The lower floor will house a glass pavilion, a prime spot for visitors to practice reverent observation of the nearby garden, as well as the community center area. The library will be located in the upper level of the structure and is pictured to become a bright and calming environment for study or leisure. There is no doubt that the public will enjoy the center for what it will have to offer once it is built, yet the designers also have included local denizens in planning for the final elements of the structure. Being receptive to the needs of the community and utilizing funds from selling existing properties in the area will allow for designers to focus on making The Missing Link a more sustainable project. The new leisure center will be a stunning addition to the city’s historic landmarks, as well.